“Ever since Samantha Winthrop's mother moved them to Lacuna Valley, supposedly in search of better weather, the list of strange questions she has no answers for has been growing out of control. Prophecy Girl wasn't always called Prophecy Girl. Writing a novel is a journey, and there were plenty of ups and downs while writing, and then revising, Prophecy Girl. First! Some facts. -- Prophecy Girl wasn't titled Prophecy Girl until the novel was already completely done. My husband named it, actually. -- The first draft was 70,000 words. The final draft was 91,000+. I actually cut out a ton. Prophecy Girl changed a lot. I really wanted to write a standalone novel. It was at around 40,000 words into my novel that I realized this was impossible. I knew what my ultimate ending was going to be, and getting there in one novel didn't make sense. It made my characters grow way too far too fast, and the plot had to whiz by without any explanation. It was like trying to watch a movie on fast forward. I struggled over the decision whether to make it a series for a very long time, but eventually I had to give up. The book wants what it wants! Once I realized Prophecy Girl was going to be a series, I knew exactly how Prophecy Girl (Lacuna Valley #1), would end. So I wrote the last 500 words. And then, I wrote four different versions leading up to that ultimate ending. You wouldn't think you could come up with so many different ways to reach the same place, but I assure you, I outlined ideas for other versions as well. I think endings are really important, and I couldn't be happier with the ending to Prophecy Girl. The ending it wound up with had my favorite jokes in it, too. "Magical GPS" is probably one of my favorite parts of the novel. There is always more that I could tell you about the journey I went on while writing Prophecy Girl. There is that Hemmingway quote about how writing a novel is easy, you just sit down at a typewriter and open a vein. I felt that throughout this whole journey. When editing, I would pull out a scene and tell my husband "This one is WRONG!" And the only reason I had for why it needed to be changed was that it didn't have enough blood, not enough guts, not enough feeling. Prophecy Girl deals with some pretty emotional and dark themes. Destiny, love, marriage, bullying, family, control, and child abuse. As a survivor of child abuse, I closed my eyes and went to the dark and twisty place, and wrote and rewrote until I felt like my darkest and most raw feelings were out on the page. Which is a thrilling and terrifying feeling at the same time. And then the next day, I had to shake those feelings off like a good little writer, play "When U Love Somebody" by The Fruit Bats on repeat, and write about the squishy and complicated feelings of first love under some very complicated circumstances (although really, isn't love always under complicated circumstances? Isn't that the rule?). I swear, writing the cute and wonderful happy scenes were just as hard as writing about being bullied at school, or being abused by your mother. I wrote, read, rewrote, read, rewrote, read, and rewrote most of the scenes in Prophecy Girl until the scenes had feeling, felt right, and I could read them say, "Yes, I opened a vein there." Between rewriting to get the feel of the scenes right, and all of the other adjustments I made while writing this story, I definitely feel like Prophecy Girl has taken me on quite the journey. I don't know that you're ever really done with a book as an author. I stop editing it, I send it out into the world... but I keep thinking about it. I still go to Lacuna Valley in my head, and not just because I'm working on the other books in the series. After spending so much time creating real characters, I don't know if there is anyway to get them out of my head really. I'm good with that. 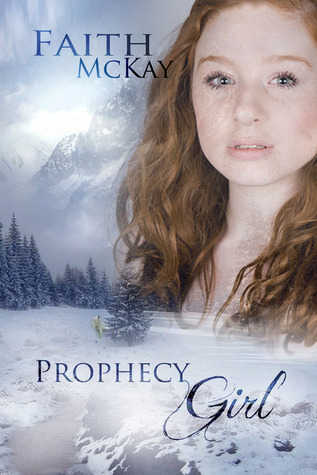 For more about Prophecy Girl check out these sites! I loved this post! And I love how your husband named the book, too! I hadn't heard of it before but it's definitely up my alley with the dark, tough issues it deals with! Faith, this post rocked! You actually helped me figure out some things for my WIP. I loved reading about your writing process with Prophecy Girl. Thank you, Faith, so much for this post! I loved reading this because you clearly put so much of your heart and soul into Prophecy Girl. I just admire the amount of effort you put into writing your book to make it just right in every way imaginable.